Have questions about GRAVOL™ products? Get the answers here. Start by selecting a category below. 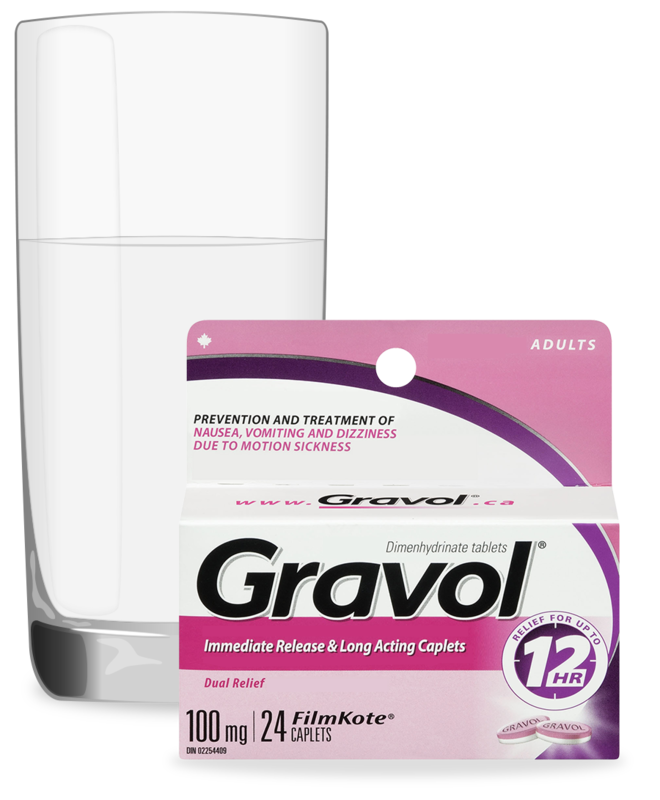 Is there a GravolTM Product that will relieve nausea symptoms without the drowsiness? Yes, GRAVOLTM Ginger Tablets, Liquid Gels or Lozenges are made with certified organic ginger (the only active ingredient) and are used for the prevention and treatment of nausea, vomiting and upset stomach. Ginger is a clinically proven anti-nauseant and does not cause drowsiness. When vomiting has started and oral treatment is no longer an option, what should be taken? Try original GRAVOLTM Comfort-Shaped Suppositories with dimenhydrinate, which are available in two dosage strengths – for 100 mg for Adults and 25 mg for Children ages 2+. GRAVOLTM Suppositories with dimenhydrinate are easy to use. Remove the foil or plastic from the suppository. For easier insertion and greater comfort, moisten, and smooth any edges on the suppository before using. Insert a half or whole suppository every 8 or 12 hours, or as recommended by your physician. To divide a suppository into two equal parts, remove it from the foil and use a knife with a sharp blade to cut through the suppository. What products can be taken without water? Adults can take GRAVOLTM Quick Dissolve Chewable and children can take GRAVOLTM Kids Quick Dissolve Chewable tablets or GRAVOLTM Kids Liquid without water. Which is the best product for children? This is dependent on the age and state of the child. If the child is younger, GRAVOLTM Kids Liquid may be more appropriate as the child is not required to chew anything. 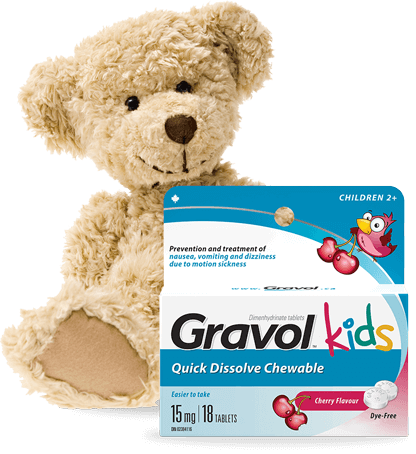 For children who are older, GRAVOLTM Kids Quick Dissolve Chewable tablets may be more appropriate as they are easy to chew and can be taken anywhere. If the child is already vomiting and they are no longer able to take oral medication, GRAVOLTM Kids Comfort Shaped Suppositories are the most appropriate option. Can GRAVOL™ products be taken when pregnant/breastfeeding? If pregnant or breastfeeding, GRAVOLTM products should only be taken upon the recommendation of a doctor. Yes, to make sure the product is right for you, please ensure you read and follow the label. How long does GRAVOL™ DMH last? Is there a limit to daily GRAVOL™ Ginger consumption? Adults and children 6 years and older should consume 2 GRAVOLTM Ginger Tablets, GRAVOLTM Ginger Liquid Gels or GRAVOLTM Ginger Lozenges, every 4 hours 1-3 times daily and not exceed 6 tablets, liquid gels or lozenges a day. What are the therapeutic properties of ginger? The main compounds of ginger are the aromatic essential oils, anti-oxidants and the pungent oleo-resin. These active aromatic or pungent compounds have been identified as gingerols, shogaols and zingerone, and they provide most of the medicinal properties of ginger. In the digestive system, the pungent compounds of ginger decrease nausea and vomiting. How much ginger is in each GRAVOL™ Ginger Tablets, Liquid Gels and Lozenges? Can pregnant women use GRAVOL™ Ginger Tablets, Liquid Gels and Lozenges? GRAVOLTM Ginger products are no longer contraindicated for pregnant and breastfeeding women. All pregnant women, however, should consult their health care practitioner before taking medication of any sort. Are GRAVOL™ Ginger products as effective as natural ginger tea or dried ginger root? GRAVOLTM Ginger Tablets, Liquid Gels and Lozenges contain proven therapeutic levels of Ginger – 20 mg of organic ginger extract (Zingiber officinale) (root & rhizome) – equivalent to 340 mg dried ginger root. This way, you know you’re getting the right amount to ginger to prevent and treat your symptoms. GRAVOLTM Ginger products are an effective natural treatment for nausea, vomiting and upset stomach. Are GRAVOL™ Ginger products safe for children to use? Is there a child version? GRAVOLTM Ginger Tablets, Liquid Gels and Lozenges are indicated for adults and children six (6) years and older. For use with children 2-6 years, GRAVOLTM Kids offers: GRAVOLTM Kids Liquid, GRAVOLTM Kids Quick Dissolve Chewable tablets, and GRAVOLTM Kids Comfort Shaped Suppositories. Although GRAVOLTM Multi-symptom Cold & Fever and GRAVOLTM Ginger Nighttime are part of the GRAVOLTM Ginger group of products, they contain Willow Bark and Melatonin, respectively, which are not suitable for children or adults under 18 years. Are there any contraindications with GRAVOL™ Ginger? GRAVOLTM Ginger Multi-symptom and GRAVOLTM Ginger Nighttime both have contraindications. To make sure the product is right for you, please ensure you read and follow the label. Can someone on blood pressure medications take it as well? There are no know contraindications for blood pressure medications for GRAVOLTM Ginger tablets, liquid gels or lozenges, however, GRAVOLTM Ginger Multi-symptom and GRAVOLTM Ginger Nighttime both have contraindications. To make sure the product is right for you, please ensure you read and follow the label and consult your doctor or pharmacist if necessary. What is GravolTM Multi-symptom (Cold & Fever) used for? GRAVOLTM Multi-symptom (Cold & Fever) is an all-in-one anti-nauseant, pain reliever and fever reducer. It is used for the relief and prevention of nausea and vomiting and the relief of headache, fever, and/or mild aches and pains. Ginger is traditionally used in Herbal Medicine to help relieve digestive upset like nausea and indigestion. Ginger is also used to prevent nausea and vomiting associated with motion sickness. Willow Bark is used to relieve headache, fever and mild aches and pains. What medicinal ingredients are used in GRAVOL™ Multi-symptom (Cold & Fever)? Ginger traditionally used in Herbal Medicine to help relieve digestive upset/disturbances including lack of appetite, nausea, digestive spasms, indigestion, dyspepsia and flatulent colic. Willow Bark is traditionally used in Herbal Medicine used to relieve headache, fever, mild aches and pains. 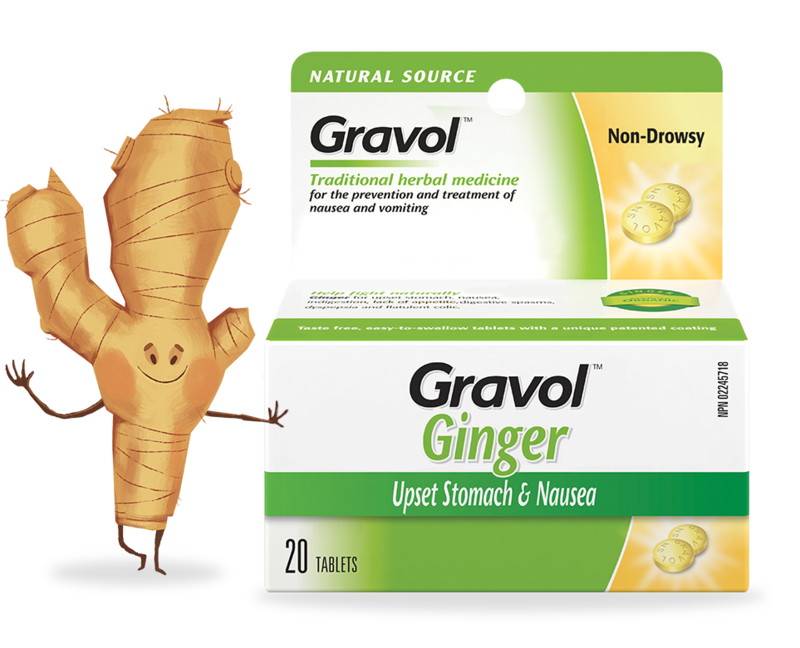 What is the difference between GRAVOL™ Multi-symptom (Cold & Fever) and GRAVOL™ Ginger Tablets, Liquid Gels and Lozenges? Ginger is indicated for the prevention and treatment of nausea, vomiting and dizziness due to motion sickness. Ginger is also traditionally used in Herbal Medicine to help relieve digestive upset/disturbances including lack of appetite, nausea, digestive spasms, indigestion, dyspepsia and flatulent colic. GRAVOLTM Multi-symptom (Cold & Fever) combines two medicinal ingredients, ginger and Willow Bark. In addition to ginger helping soothe upset stomachs, Willow Bark is used in Herbal Medicine to help relieve headache, fever, and mild aches and pains. What are the therapeutic properties of Willow Bark? Willow Bark is used to ease pain and reduce inflammation. Researchers believe that the chemical salicin, found in Willow Bark, is responsible for these effects. Studies have also identified several other components of Willow Bark that have fever-reducing properties. The bark of white willow contains salicin, which is a chemical similar to aspirin (acetylsalicylic acid). Salicin is the main component responsible for the pain-relieving and anti-inflammatory effects of the herb, salicin was used to develop Aspirin. Is GRAVOL™ Multi-symptom (Cold & Fever) safe for children to use? Is there a children’s version? GRAVOLTM Multi-symptom (Cold & Fever) is an all-in-one anti-nauseant, pain reliever and fever reducer. It is used for the relief and prevention of nausea and vomiting and the relief of headache, fever, and/or mild aches and pains. Ginger is traditionally used in Herbal Medicine to help relieve digestive upset like nausea and indigestion. Ginger is also used to prevent nausea and vomiting associated with motion sickness and postoperative nausea. Willow Bark is used to relieve headache, fever and mild aches and pains.